A vise is a mechanical device you can use to hold a workpiece securely in place. If you want to do woodwork and metalwork applications, it’s something that you can’t do without. A bench vise is called so because it’s typically attached directly to a workbench to perform operations on a workpiece such as sawing, drilling, and planing. It consists of several parts. The components that are responsible for holding your workpiece are the jaws. The set of jaws consists of a fixed one and a dynamic or a sliding one that moves parallel to it. They secure the workpiece with a screw mechanism that brings the moving jaw closer to the stationary one until they tightly fasten upon the workpiece. The jaws are usually made of wood, plastic, or metal. The choice depends on what you’ll be using your vise for and if you’re going to use it for light, medium, or heavy-duty jobs. You don’t necessarily have to attach it to a work bench as long as the work surface is stable enough. You can attach it either directly to the surface or the side. If your vise is attachable directly atop of a surface it should feature a swivel to enable the vise to rotate to the angle you find most convenient. When you’re doing drill work, you’re going to need a lot of concentration and precision. This is where the bench vise shines. It tightly holds your workpiece in place and provides you with all the stability you need to make the perfectly precise cut. While drilling requires a lot of precision, sawing can’t be done without the most precise tools and performance. This is because the sawing process involves a lot of recoil and kickback. And that’s why a bench vise would be your perfect ally for sawing as it holds the object very securely and enables you to safely choose the optimum intensity and pressure to apply on your workpiece. Whether you’re cutting wood or metal, a bench vise would be a great way to hold it in place so you can get the best and most accurate results. Assembling something by gluing it can be quite a hassle and a difficult task. As you work, you’re always prone to gluing the wrong things together –including your fingers to the workpiece. That’s why a bench vise is a great way to spare yourself all this trouble. You can use it to hold the objects you want to glue in place and then leave them fixed in the vise’s jaws until they dry. This maintains the desired structure and makes the whole process easier. Giving your wooden workpiece the final touches by smoothing its surfaces with sandpaper requires that it remains stationary for the duration of your work. You can even use it for final touches and welding metals if it has metal jaws that can handle keeping the metal in place. Having a bench vise to do that job is a great way to progress through your sanding and get to the priming and coloring. It makes the whole crafting process easier and safer as it absolutely minimizes the possibility of injury by securing your object in place. To cut an electrical conduit, it’s of utmost importance that you have it firmly secured in place before you begin working on it. This is where the bench vise comes in and offers you the perfect way to cut the electrical conduit. 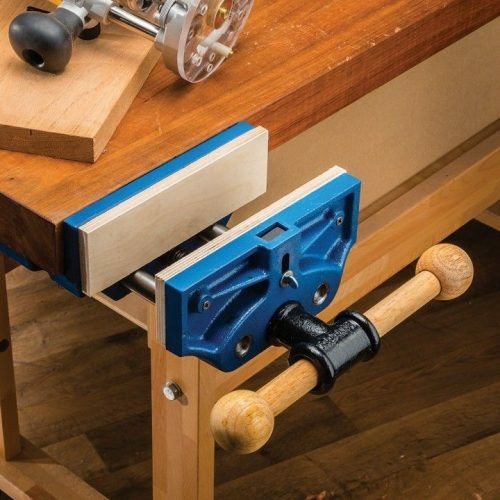 Besides all the aforementioned functions, you can use your bench vise simply as a workbench. Most of them have anvils that provide you with more than enough space to do your work while providing you a stronghold on your workpiece. All-in-all, a bench vise is a great addition to any craftsman’s tool kit. It provides you with the functionality of a workbench plus a whole other variety of functions.